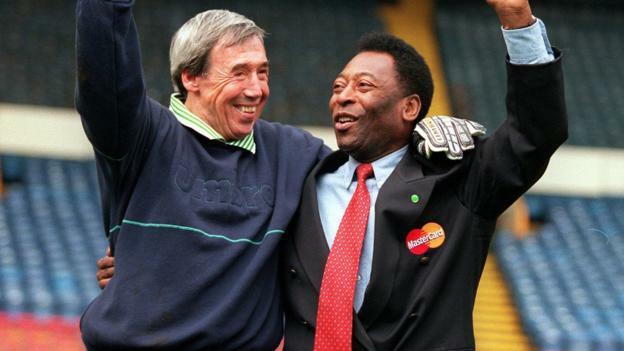 World Cup winner Gordon Banks was a “goalkeeper with magic”, says Brazil legend Pele, after the former England goalkeeper died at the age of 81. The football world has been paying tribute to Banks, who won the 1966 World Cup and made a stunning save to deny Pele at the 1970 tournament. But iconic forward Pele, 78, said he was “glad” his header was saved. “That act was the start of a friendship between us that I will always treasure,” he said. Three-time World Cup winner Pele said on social media: “I have great sadness in my heart today and I send condolences to the family he was so proud of. Banks’ save to deny Pele 49 years ago has been described as the ‘save of the century’ and Pele has previously admitted he thought he had scored. “For many people, their memory of Gordon Banks is defined by the save he made against me in 1970. I understand why,” Pele added. “The save was one of the best I have ever seen – in real life and in all the thousands of games I have watched since. “When you are a footballer, you know straight away how well you have hit the ball. I hit that header exactly as I had hoped. Exactly where I wanted it to go. And I was ready to celebrate. “But then this man, Banks, appeared in my sight, like a kind of blue phantom, is how I described him. “He came from nowhere and he did something I didn’t feel was possible. He pushed my header, somehow, up and over. And I couldn’t believe what I saw. Even now when I watch it l, I can’t believe it. I can’t believe how he moved so far, so fast. “I scored so many goals in my life, but many people, when they meet me, always ask me about that save. While it was indeed phenomenal, my memory of Gordon is not defined by that – it is defined by his friendship. He was a kind and warm man who gave so much to people. “I patted him on his head, and I said ‘why didn’t you catch it?’ and the abuse that came back was unbelievable,” he told BBC Radio 5 live.